In an effort to deflect blame for high gasoline prices away from the Obama Administration, the Department of the Interior today released a report which purports to show that the oil and gas industry, not DOI or BOEMRE, is guilty of dragging its feet on offshore energy exploration and development. This, in spite of a 10 month regulatory moratorium/permitorium that has brought new well drilling to a near standstill, and the first year-long offshore lease sale hiatus since 1958. This is propaganda, pure and simple. Interior’s career staff certainly knows better, but for the time being they find it expedient to facilitate the Obama/Salazar green crusade against the American oil and gas industry. As a result, the report is one which is only meant to bolster Democratic talking points which twist reality. WASHINGTON – A report requested by President Obama and released today by the Department of the Interior shows that more than two-thirds of offshore leases in the Gulf of Mexico and more than half of onshore leases on federal lands remain idle, neither producing nor under active exploration and development by companies who hold those leases. According to the report, more than 70 percent of the tens of millions of offshore acres under lease are inactive, neither producing nor currently subject to approved or pending exploration or development plans. This includes almost 24 million inactive leased acres in the Gulf of Mexico, which potentially could hold more than 11 billion barrels of oil and 50 trillion cubic feet of natural gas. Where to begin fisking this mess? The majority of the idle offshore leases are in deepwater. Drilling and development costs in deepwater require the discovery of very large fields to justify development. Smaller accumulations which might justify development nearer to shore or in shallower water are abandoned as uneconomic. Oil and gas are not uniformly distributed, as DOI’s focus on acreage statistics seems to imply. All leases were not created equal; only the ones which contain the necessary elements for hydrocarbon accumulation are particularly valuable. 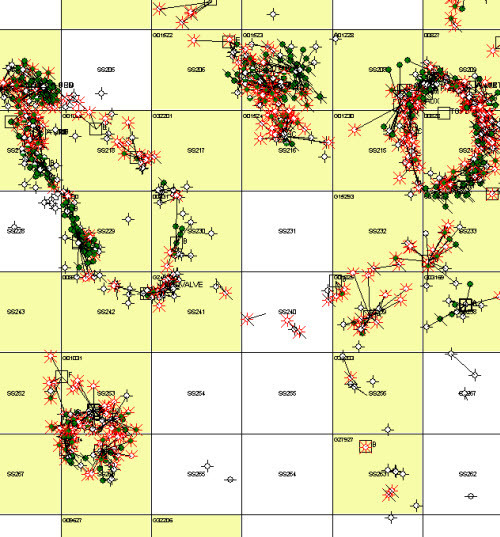 As Figure 1 below shows, most of the oil and gas is found clustered on discrete geologic features. Geologic and geophysical studies are needed to separate highly prospective leases — the “high ground” — from the much less prospective (and hence less valuable) “goatpasture” in between. Fields of sufficient size to be produced are more sparsely distributed in deepwater than on the Shelf, in shallower water. An operator earns the right to enter a lease with the BOEMRE by competitive bid, and the lease represents an exclusive option to explore for and develop oil and gas for a specific term. Deepwater tracts have up to 10 year lease terms, versus 5 years on the Shelf. Many of the deepwater leases were acquired speculatively, for bids at or near DOI’s minimum bid. Many of them were acquired before technology and infrastructure existed to make their development feasible; and for many of those, that is still the case. The government’s resource estimate is just that — the government’s resource estimate. It is a statistically derived guess, not industry’s estimate reflective of specific field data; with the qualification “technically recoverable resources”, economics have not been taken into account. Many shallow water leases have been leased multiple times. Some that are in the DOI’s “idle” statistics are blocks that have been explored, produced and abandoned before being leased by another company for an entirely different exploration play. The Shelf is like a cotton field that has already been picked over two or three times. It is not hard to figure out why the 2009 and 2010 Lease Sales were not terribly active (especially relative to 2008) in the Central and Western Gulf. Oil and natural gas prices were at all-time highs in 2008. By 2009 prices had plummeted, along with the economy. Gas prices have stayed low, and most of the Shelf drilling is for gas. Many Shelf blocks that were bid assuming $8-10 per mcf gas are no longer economic at $4. This is not rocket science. One of the Obama Administration’s first budget proposals upon taking office in early 2009 was to increase taxes on oil and gas. It can hardly be a surprise that those proposals caused industry to reconsider its drilling plans. DOI offers statistics on the number of acres offered in the 2009-10 lease sales, but many of the leases offered have been picked over before, or are well outside any known producing trends. The second lease sale of 2010 was cancelled in the aftermath of the BP spill. The BOEMRE has only issued a few permits in the last year. Each week for the last six weeks, they have granted new deepwater permits with great fanfare, but these permits have so far allowed renewed activity on about a third of the wells where activity was suspended after the BP blowout. Of the three dozen or so shallow water permits, virtually all are for gas drilling. BOEMRE has refused to consider an operator’s ability to secure a permit as a factor in granting lease extensions. The Administration has proposed a new “use-it-or-lose-it” fee for undrilled leases, even though the leases already contain specific provisions for annual rentals in the event a lease is not drilled. A couple of example maps may help make my point. The first is a detail of a portion of the shallow water Shelf. Each block is approximately a three mile by three mile square of open water; white designates unleased blocks, yellow the tracts currently being leased by an oil and gas operator. You’ll note that some of the white “open” blocks contain wells; those leases were previously drilled and produced to depletion and abandonment, and the leases were relinquished back to the Feds. Some of the yellow blocks may be second- or third- generation leases, meaning that production was found early-on, produced and plugged out. A newer lease may have been taken by a new operator for a completely unrelated prospect (possibly deeper drilling). In that case, the new “undeveloped” lease would count in the DOI’s “idle lease” statistics. The geographic distribution of the wells defines the geologic structures where the oil and gas may be trapped. In between those defined structures, you’re a lot more likely to drill a dry hole. 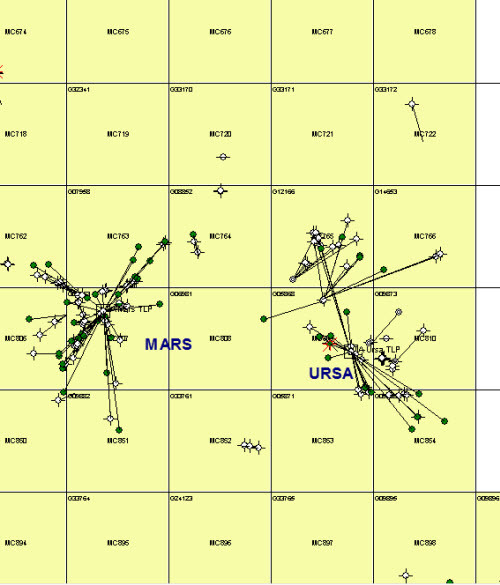 The second map is a detail near two large Shell deepwater fields named Mars and Ursa. You do see a lot more undrilled and undeveloped leases in deepwater, but that’s because the only deepwater prospects that get drilled are the “elephants”. Small and medium-sized prospects which might be highly profitable on the Shelf will not merit drilling on a deepwater tract. DOI’s study creates the false impression of an industry that is dragging its feet, sitting on leases with no intention of developing known oil and gas accumulations. Nothing could be further from the truth. Industry has no way to make money by paying for leases that never get developed. That’s one point that seems to escape industry outsiders and a legion of Google-educated 15 minute know-it-alls. Unfortunately, that description applies to the people who seem to be able to influence energy policy under the Obama/Salazar regime.